The arch of your foot is made from a curve in the tarsal and metatarsal bones, which act as a natural shock absorber. During standing, walking, running or any movement on your feet, the arch is supposed to cushion the impact from the feet, ankles, knees and hips. The height of this arch determines whether someone has a high arch, normal arch, low arch or no arch at all. People without an arch are classified as having flat feet and are more prone to injuries and stress on the body. With flat feet, it's important to pay extra attention when choosing shoes so you get the necessary support. There are three types of shoes that are recommended for flat feet. People with flat feet should not wear shoes without any support such as flip-flops, sandals or high heels. These do not give the arch any lift. When looking at shoes, ones that say "added support" generally mean they are technically designed to do what a normal arch is supposed to do. 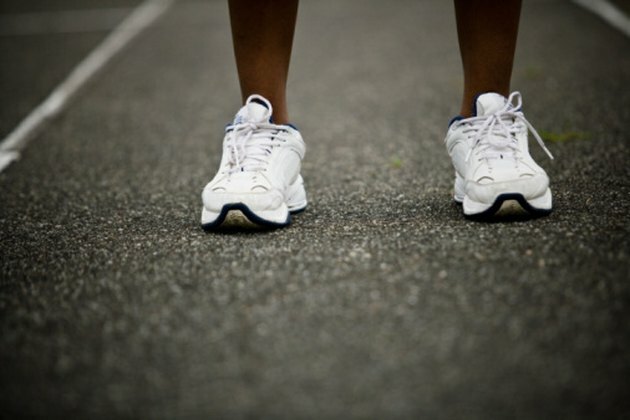 People with flat feet tend to pronate, or turn their ankle inward when they walk or run. This can lead to stress on the ankles, feet and knees and potentially cause a number of injuries. Normal arches help people maintain a straight landing on the foot, but without a proper arch, shoes with stability control can help correct this pronation. Most brands of running and walking shoes have their own lines of stability shoes. For more severe pronators, motion control shoes are necessary. They are a step above stability shoes with additional support and control to keep the ankle straight when moving forward. According to RunningShoesGuru.cm, "The main technology found in motion control shoes is a medial post of dual density foam. Footwear producers inject a harder compound of foam right below the medial side of the arch and sometimes extended all the way to the heel. It is easily recognizable as a darker (almost always gray) piece of foam on the inside of the midsole."